We’re occasionally asked why we’re interested in building a cloud-based directory or, as we like to say, a business focused on Directory-as-a-Service. It’s a great question and really goes to the core of what a cloud identity management platform is and how we got here. Historically, companies that needed a directory service called upon Microsoft for their Active Directory solution. Alternatively, they would call upon OpenLDAP if they had the appropriate staff on board to install, configure, and manage it. The goal was for the IT admin to be able to create user accounts and manage access to systems, applications, networks, and more from one central user management system. Since the platforms were virtually all Microsoft Windows and located on-prem at the time, AD was an easy choice. It could easily manage and control all of the IT assets without too much trouble. If you did have Linux/Unix machines, you would leverage OpenLDAP. Over the past few years, the homogeneous Windows, on-prem IT network has dramatically changed. Today, the IT infrastructure looks nothing like it did a decade or two ago. Instead of being wired, the network is WiFi. Only one in five devices is Windows, applications are web-based, and the data center really is just a cloud provider, such as AWS or Google Cloud. An organization’s user base may not actually be located in their offices. While users could be located around the world, they may not even be employees. The challenge of centrally controlling user access to all of these different types of resources is daunting. Some organizations have tried to leverage G Suite Directory or Azure Active Directory, which is Office 365’s equivalent, as their central identity provider. Unfortunately, the solutions aren’t meant to be a true directory service in the broadest and most historical sense of the term, especially when it comes to managing devices, networks, on-prem applications, and broader authentication needs. IT organizations struggled to figure out a path to create a central identity provider for their on-prem and cloud IT resources. The problems and trends enumerated above are precisely why we have focused on building a cloud identity management platform. We see a great opportunity to help simplify user management all from the cloud. To eliminate the need for on-prem software. To extend existing directories to the cloud and to manage other devices, such as Macs and Linux machines. And to be a simple, ubiquitous, highly secure, and cross-platform solution. We are passionate about helping organizations take advantage of the cloud era. And helping them control and secure their users and IT resources is critical to making that happen. 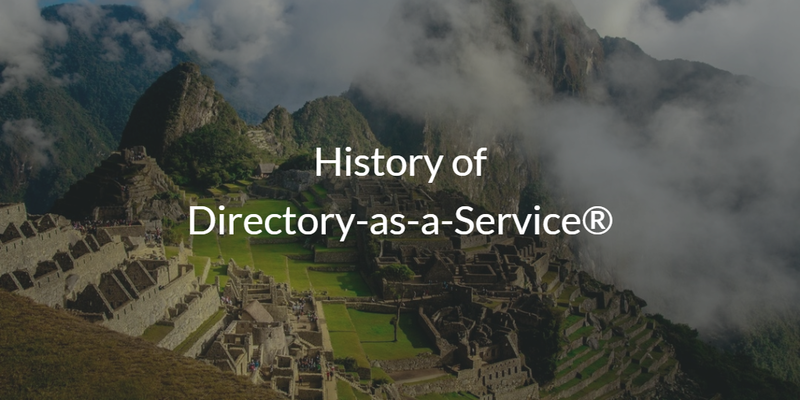 So, that’s a little history on Directory-as-a-Service and how we got to a modern IDaaS platform. If you would like to learn more about how you can replace Active Directory and move to a modern cloud directory service, drop us a note. Also, please give our SaaS-based directory a try. Since your first 10 users are free forever, sign up for a free account now.